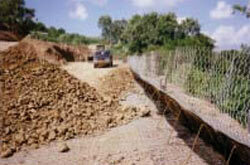 CHASM can accommodate slope reinforcement using both geo-textiles/geo-grids and earth nails. Their positive contribution to the shear strength of the slope is incorporated directly within the Bishop equation. In CHASM, earth nails add reinforcement by friction with the surrounding rock/soil and geo-textiles/geo-grids mobilise reinforcement due to the weight of ground above them. For both techniques, a factor of safety can be applied to all parameters supplied by the manufacturer to account for time degradation and parameter uncertainty.